This would have been reported as tachycardia if Channel III was not available! (Not sure what the reason for this artifact is. Recording was auto-triggered by the event monitor. Patient does not know; was probably sleeping). 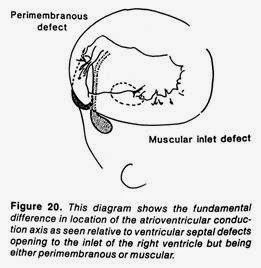 Course of His bundle in VSD: Figure below shows the relationship for membranous VSD and inlet-muscular VSD (Note: Inlet-muscular VSD is different from inlet-VSD in AVSD. Inlet-muscular VSD has a rim of myocardium separating the VSD margin from the tricuspid valve annulus; whereas, in inlet-VSD in AVSD, AV valve annulus itself if part of the VSD margin. (See also separate posting for relevant images). Image from Anderson RH, Wilcox BR. J Card Surgery. 1992;7:17-34.